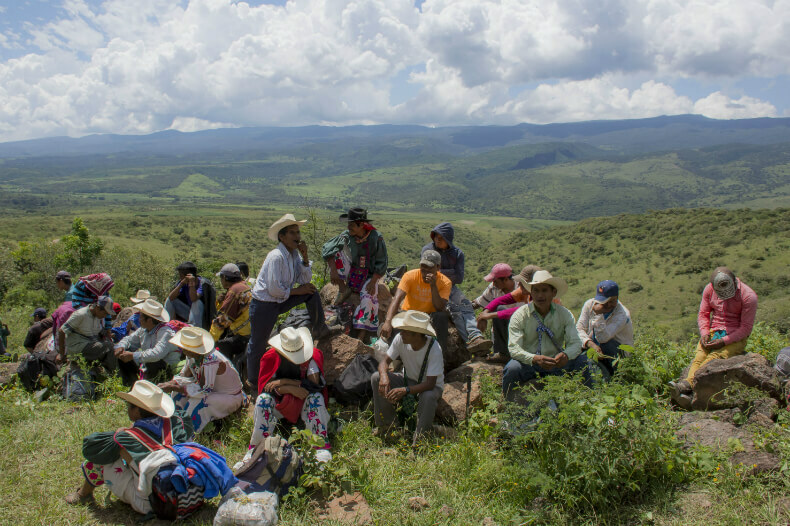 Este artículo está disponible en español aquí GUADALAJARA — As commissioner of public lands for the indigenous Wixárika territory of San Sebastian Teponahuaxtlán, Miguel Vázquez Torres was at the forefront of the legal fight to recover 10,000 hectares of indigenous ancestral lands from surrounding ranching communities. He was among those who repeatedly urged the federal and state governments to intervene to prevent violence in the increasingly tense region that had been the subject of land conflicts for more than a century and, more recently, an increasing presence on the part of the drug cartels. So it was particularly painful to learn that Miguel and his brother, Agustín, a young attorney also active in the land restitution project have become victims of the violence that they had worked so hard to avoid. They were both gunned down on Saturday. Preliminary investigations implicate an organized crime cell operating on the border between Jalisco and Zacatecas states. 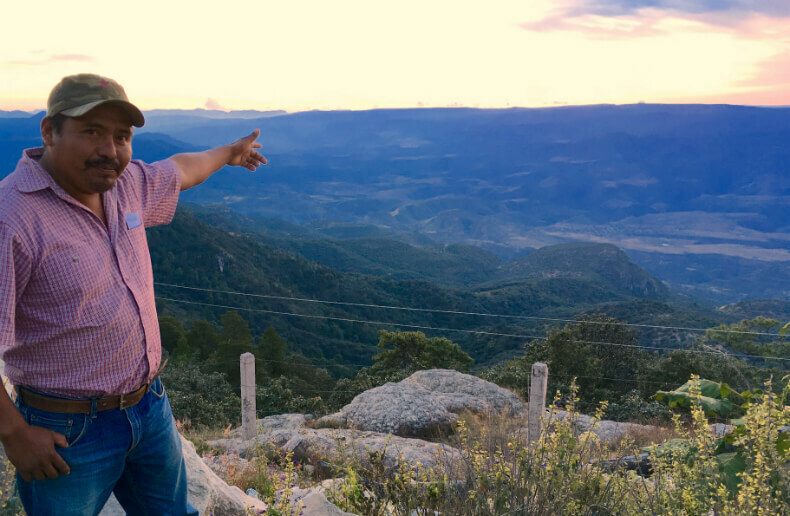 Miguel Vázquez Torres, the Wixarika leader most responsible for mobilizing an effort to reclaim 10,000 hectares of ancestral lands, shows the vast expanse of lands belonging to San Sebastian Teponahuaxtlan. Photo: Nelson Denman photo. Alfonso Hernández Barron, inspector for the State Commission on Human Rights, had worked with both of the victims extensively over the years. Agustín had just finished his professional practice as a human rights attorney under Hernández’ tutelage and was preparing to take on a greater responsibility in the land restitution case. Agustín left a wife and a young daughter, as did Miguel. Hernández described Miguel as a leader who headed the greatest effort in many years for the recovery and defense of his peoples’ territory – a historic effort in many respects. 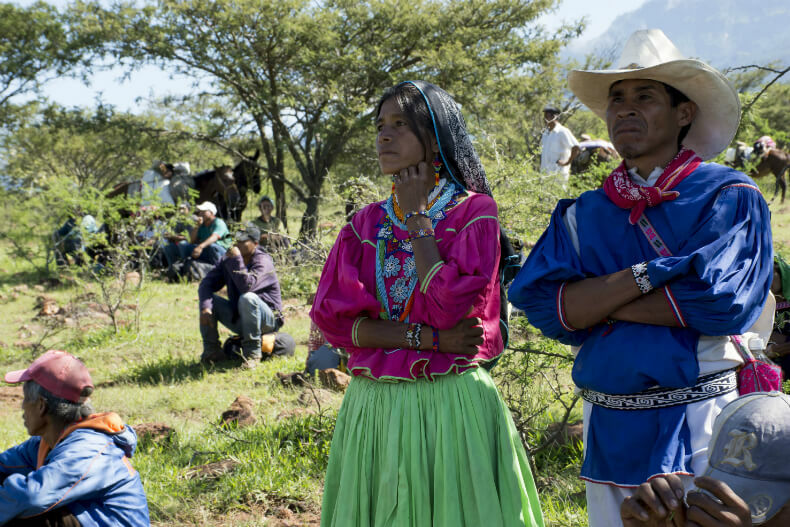 Miguel Vázquez served as guide and host to an Intercontinental Cry team, including this reporter, who went to investigate the community’s land restitution process last year. We traveled extensively together in the sprawling 240,000-hectare territory of San Sebastian and Tuxpan de Bolaños, in the state of Jalisco. 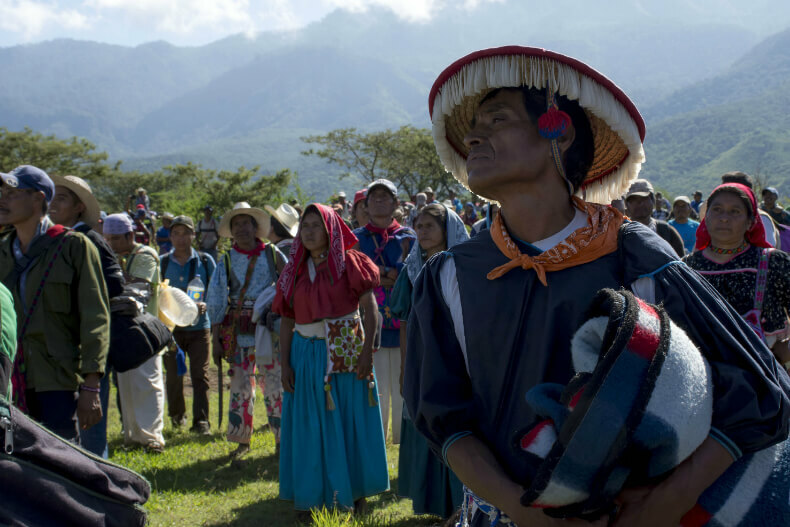 After a nearly 50-year battle for 10,000 hectares (24,710 acres) across the state line in Nayarit, the courts were now in the process of returning this land to the Wixárika community, which held the title dating back to the Spanish crown. Ranchers who held titles dating to the early 1900s had farmed the land for generations and were resisting the take-back. Some of them were spoiling for a fight. 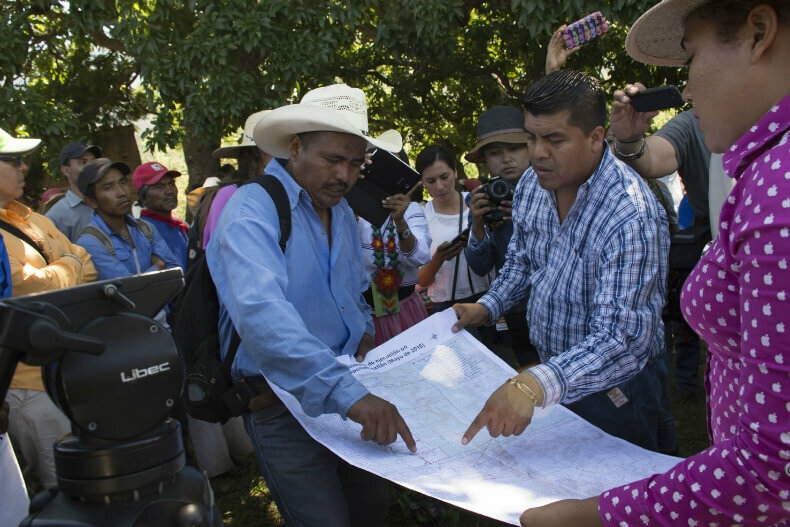 Miguel Vázquez Torres, left, goes over a map of the territory to be restituted on Sept. 22, 2016, with Wixárika attorney Santos de la Cruz Carrillo. Photo: Abraham Pérez. After the first in a series of court rulings in favor of the Wixaritari, community leaders including Miguel had repeatedly petitioned the federal government to indemnify the ranchers under a federal fund set up to prevent violence in cases such as this one. They also asked the state and federal governments to provide security and to help enforce the Sept. 22 transfer of the 184-hectare parcel, an abandoned ranch near the town of Huajimic. Despite threats from ranchers who did not accept the validity of the court ruling, the government failed to respond to their pleas, Vázquez said. 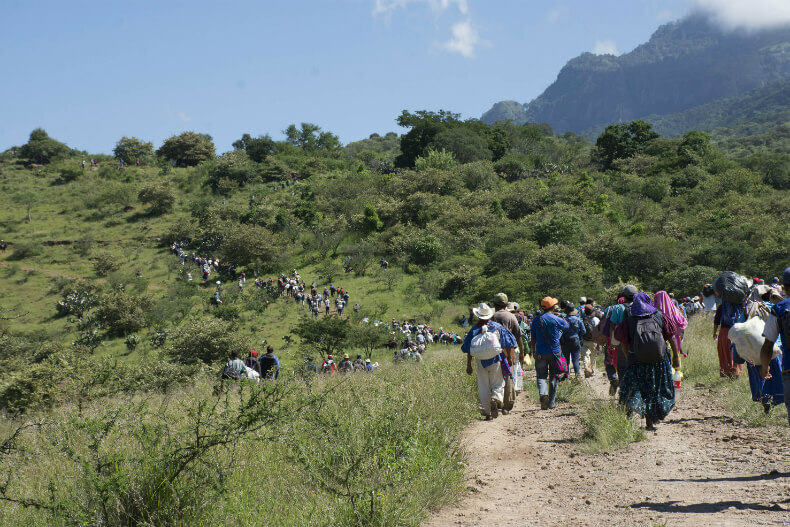 So on the day that the court had set for the land transfer, he and other leaders mobilized nearly 1,000 community members to meet the federal agrarian officials and occupy the land. Angry ranchers responded by setting up a roadblock and refusing to let the court officials, attorneys, journalists and Huichols leave. Vázquez was among those who negotiated directly with leaders in the ranching community of Huajimic to set up a dialog table, and for months the group met in an attempt to pressure the government to indemnify the ranchers who were being forced to relinquish their lands. The government responded that the country was faced with too many land disputes and not enough money in the special fund. In a March telephone interview with IC, Vázquez said there had been no progress in the negotiations because the government had not responded to further petitions on the part of the dialog table. He mentioned that they were preparing to take action on another restitution claim, and he confirmed media reports that the community was seeking to organize an armed self-defense group. Vázquez and other community leaders were involved in discussions with state law enforcement representatives about the establishment of such a community police force when he and his brother were killed. Santos Hernandez, the new public lands commissioner that Miguel Vázquez had prepared for this role, spoke to IC by telephone on Tuesday, and confirmed Hernández’ assessment. “Nobody feels like working or traveling in their cars – they are watching all of us and our families,” he said of cartel operatives in the area. The government has been extremely slow to respond to calls for help, he said. Since the homicides the government has sent in a special force, and Hernandez said he hopes they will staff checkpoints on the roads and maintain a permanent presence. State human rights inspector Hernández worried that the attacks pose a threat to the cultural integrity of the Wixárika People. Authorities at the federal and state levels had repeatedly asked for government intervention in the troubled area. Two separate congressional resolutions, one at the federal and one at the state level, had been passed in recent months urging restitution of the ranchers and for the state governments to provide greater security in the region. Rep. Clemente Castañeda, House Minority Speaker in the Mexican Congress representing the national Citizen’s Movement Party, said that state government officials should have intervened in the region in a serious way a long time ago. “The federal and state congresses gave timely warning to the governments of Nayarit and Jalisco about the risks present in the northern zone (of Jalisco), and what might occur – and what lamentably has just occurred,” said Castañeda, who sponsored a resolution calling for restitution and greater security in the region. The resolution passed the full Mexican Congress on Feb. 14 of this year. The brothers’ homicide may or may not be related to their public role in the land restitution case, he said, but if the government knew that organized crime was operating in the area, he said, there was even more reason to have a strong presence there. Rep. Fela Pelayo, the head of Jalisco’s congressional commission for indigenous affairs, has been petitioning the government since last fall to intervene in the territory. She sponsored a similar resolution that passed the Jalisco state congress unanimously in October, less than a month after the tense standoff in Huajimic. In late January, she learned that the Wixárika leaders were planning to establish an armed self-defense force in the face of governmental action and continued threats. She became alarmed and called a press conference to urge the government to act. Guadalajara anthropologist Francisco Talavera Durón has worked closely with Pelayo and others throughout the region who have sought to support the Wixarika community over the years. He remembered sadly some of the last words he heard from Miguel, who was speaking at a press conference on the lack of government intervention. “We indigenous people don’t represent political capital for the political parties; that’s why they don’t have us on their agendas,” Miguel said at the time. 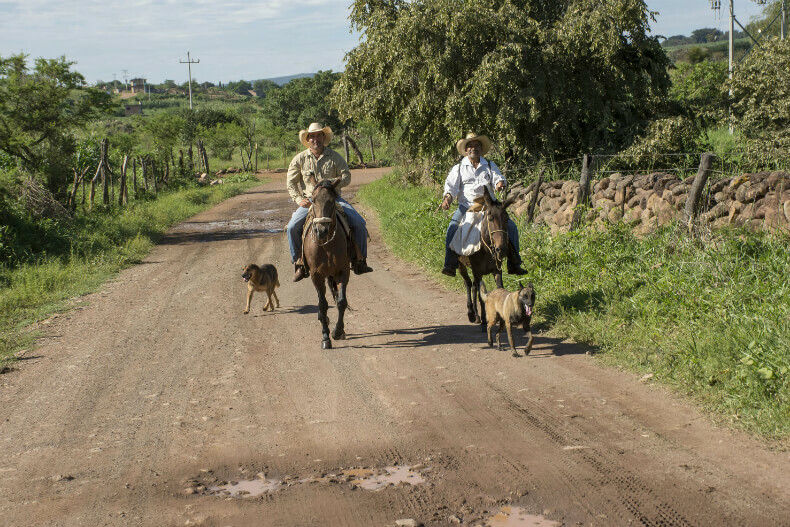 Talavera said the Wixárika territories are among the most abandoned in the country – not just on the physical level, with a lack of roads and infrastructure, but also from the perspective of justice and basic legal protections. “For me the deaths of Miguel and Agustín represent a huge blow to indigenous leadership,” he said. “We’re very worried because there are many indigenous leaders in the entire state who are defending their territories, and with the deaths of these two companions it puts them in a doubly vulnerable situation and on high alert.